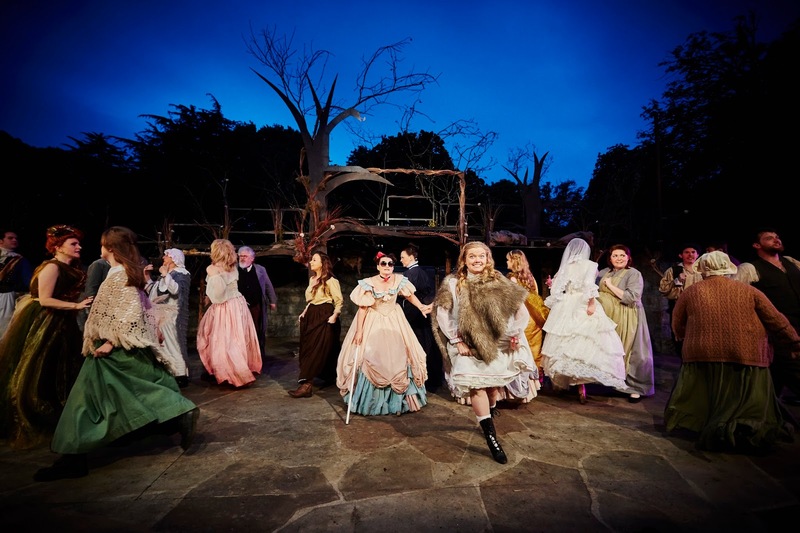 Cardiff Open Air Theatre Festival opened in style with Sondheim’s classic Into the Woods last night. It is a visually spectacular production which makes brilliant use of the fittingly wood-filled backdrop. And the large and impressive cast taking on one of musical theatre’s most challenging scores. 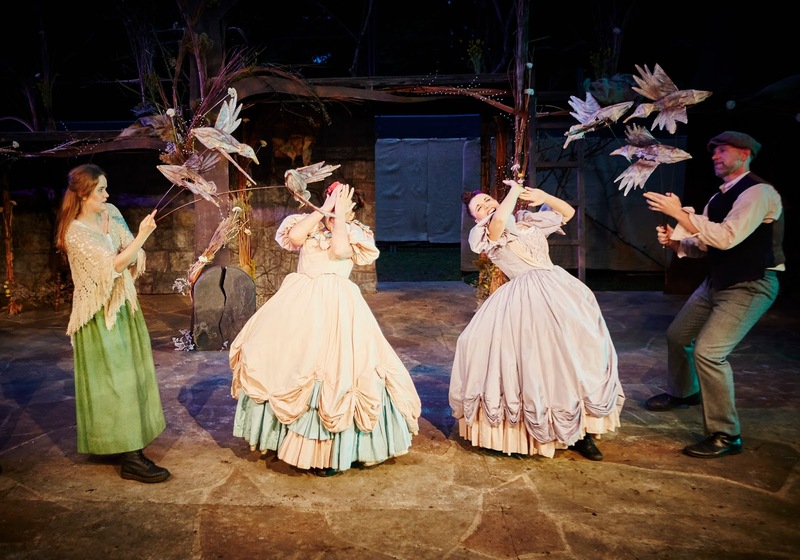 Into the Woods is Sondheim’s twist on fairy tales. From Cinderella to Red Riding Hood to Jack and the Beanstalk, these stories are mixed together and mixed up from the familiar Disney versions. The first act is familiar, the Baker and his wife, on a quest from a mysterious witch, are seeking things that only familiar fairytale characters can give. They need a cow as white as snow, a coat as red as blood, hair as yellow as corn and a slipper of gold. This leads them to cross paths with Jack, Red Riding Hood, Rapunzel and Cinderella. In the process Jack ends up with his magic beans…something that never ends well as we all know. For the first act it does all end well. The witch’s curse is broken, Cinderella gets her Prince and after their journey into the woods, everyone is happy…for a moment. Things unravel in Act 2 when the consequences of everyone actions are felt. Sondheim’s work is always a challenge and musical director Rob Throne jnr has done an amazing job with both orchestra and performers. It’s a difficult score accompanied by some of Sondheim’s most tongue twisting lyrics, but the cast rises to the challenge beautifully. Meredith Lewis as Cinderella and Jo Herco-Thomas as The Witch both give some beautiful vocal performances. Director Richard Tunley does an impressive job at directing what is potentially an unwieldy piece of musical theatre. With so many characters and so much action it could potentially be a messy production, but there is a clarity and consistency to Tunley’s staging that makes the story lines clear and the characters leap to life. The large cast also does an excellent job of weaving this difficult story consistently. All of the actors deliver memorable engaging and emotional performances. From the endearing Baker and his wife (Matthew Preece and Laura Phillips) who are the emotional centre of the story, and utterly believable and entertaining as this struggling couple. To the charming (pardon the pun) Princes who deliver hilarious performances that allude to not keeping your sword in it’s scabbard! 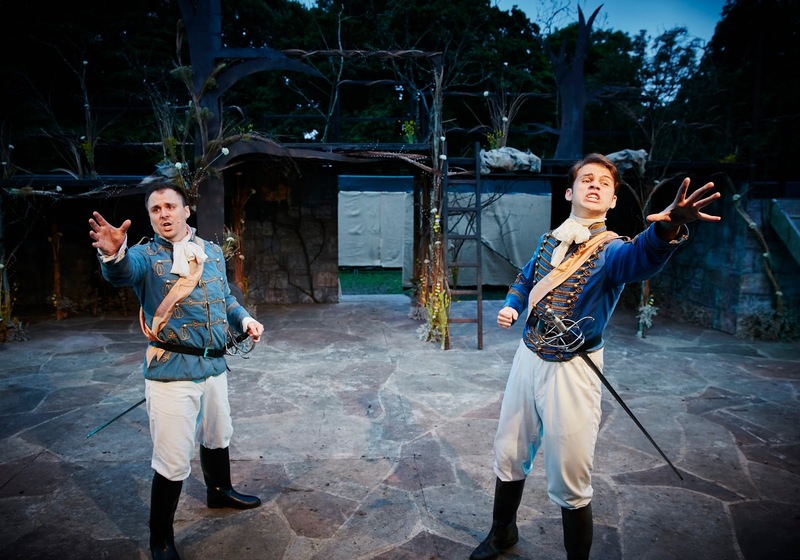 (Tom Elliot and Lewis Cook) to a scene stealing performance from David Stephens as the Wolf. 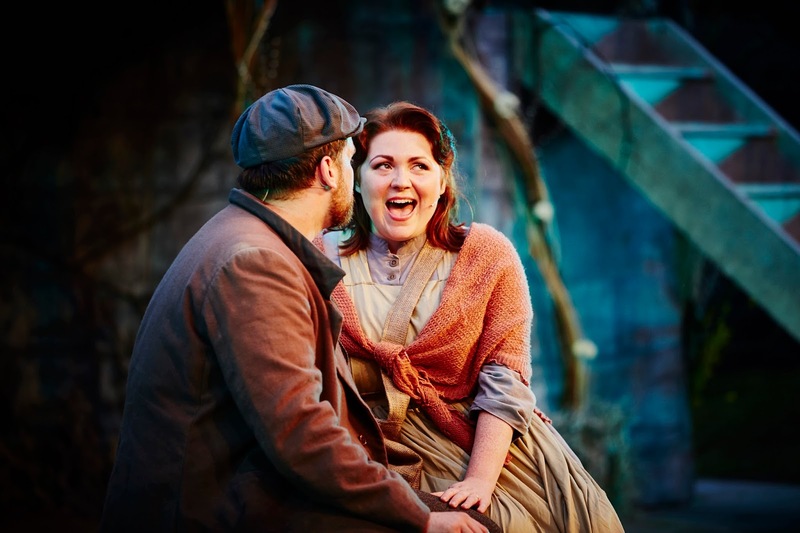 Into the Woods is an incredibly witty and fascinating piece of theatre. There are moments you’ll laugh aloud, moments you’ll marvel at Sondheim’s wit and other times he’ll pull at your heart with emotion. Sondheim is difficult to get right, and is often difficult for audiences to get into, it takes a particular kind of production and a particular kind of understanding to get that. This production gets it. I could sense and hear around me audience members who don’t know Sondheim marvelling at his wit and storytelling through this performance, and it was a beautiful thing to see. 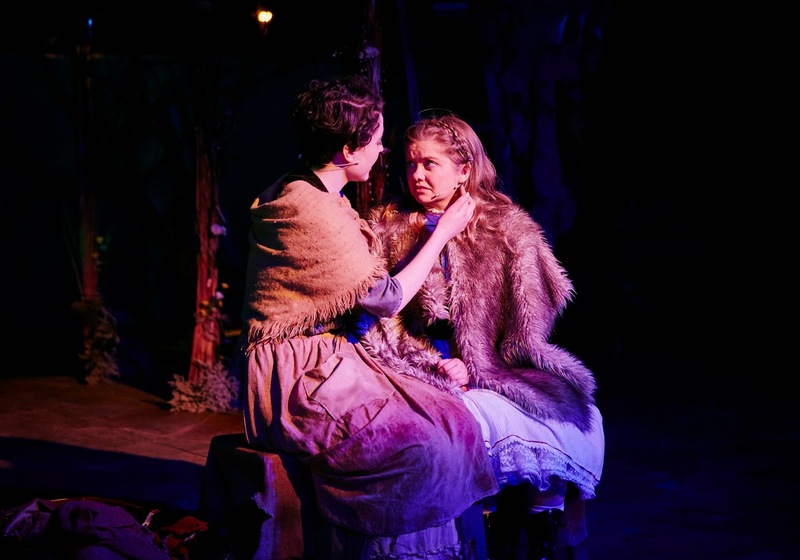 Into the Woods ends with the haunting refrain ‘Children will Listen’ the warning song to the audience, and a lament on Motherhood. Set against the backdrop of darkened trees outside, after three hours of Sondheim’s magic worked by this hard working cast, it was a haunting lullaby into the night that lingered on much after. As a closing note, the world around us changed a bit last night while I watched this production- I heard the clock strive 10 marking the close of the EU Referendum vote and wondered what was next. None of us knows, but as ever the arts are likely to suffer. So as a close to this review I’d like to say to readers, please, please support arts in your commuity. Go out and see performances, get involved. Because the arts need all our support to continue. 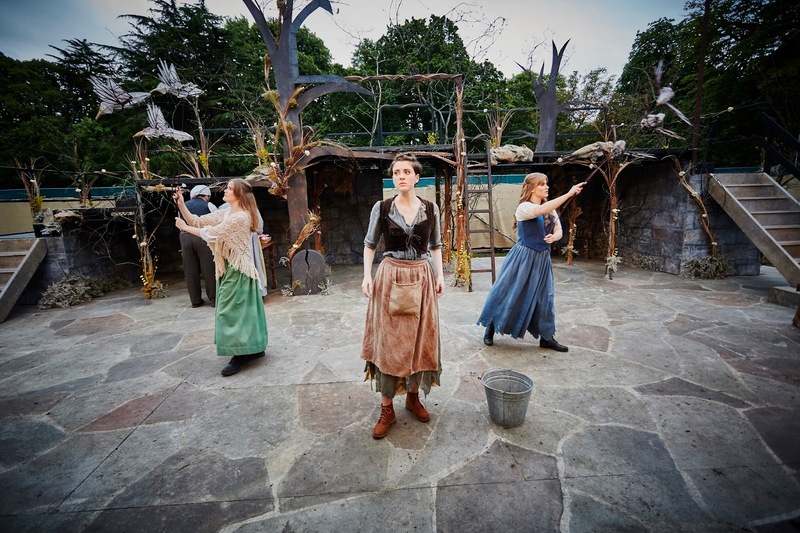 And of course you could do worse than starting with this or any of Cardif Open Air Theatre Festival of course! everymanfestival.co.uk or call the box office on 0333 6663366.